LOL Eden keep on salivating. He never said that the ones who are gone will come back. Never, never, never. Yes he said it will expand. Didn't mention a country you are trying to tell us which. That mf guy on the video is a freaking liar or he doesn't understand amharic. As Eritreans we don't give a crap if ethiopia has plan to expand. But expanding it as a country with Eritrea ain't happening ever. All this lame scare tactic doesn't work with Eritreans. Tell that scum bag to learn Somalian or Kenyan or Arabic (sudan) and try to scare them. How soon did you forget when PIA & PMAA said (not that it matters to us) that the regional countries who are working for peace and economic integration.......their sovereignty and territorial integrity will be respected? How does that square with yours and the nut case agame in the video's stupid assumptions? We know how to keep our territorial integrity and sovereignity if push comes to shove. Game is over for you filthy agames. So keep on turnining every rock to create friction untill one day a cobra bites your a'ss when you try to turn the other rock. And oh yeah, if we were a'ss holes or back stabbers, it is much easier for us to divide any backstabber than the backstabber to encroch on us. Desperate agame Eden, your life must be really sad after the death of your beloved zena. May he rest in hell. How pathetic are you to always try to instigate hate. You stupid parasite think we're going to quarrel over some dumb stuff that a low iq like you posts qiqiqiqi we have successfully destoyed you and made you irrelevant. What some sellouts do in DC is not going to save you. 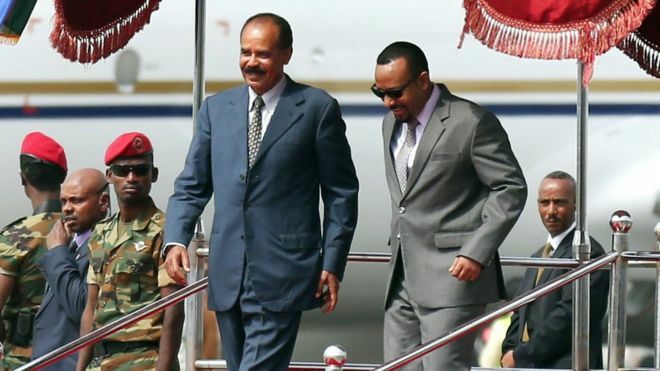 Eritrea and Ethiopia will never go to war again, the future is bright without you vermin. Eden , are you trying to give hope to the Mekele “ prisoners ?” You did not do well. Abiy, as a reasonable politician, does not think every breathing Eritrean agrees with him politically. He pretty much , I am sure, knows there are Eritrean oppositions who cry nonstop because their favorite the Sebhat dynasty is no longer in control of Ethiopian politics. And they might have a rally. But dear Eden that is not news. First and foremost, Brother Sam has understood very well and he does not need any approval from your twisted agame heart. My advice to the useless Agames is that if your demonstrations after demonstrations have not worked for the last 20 years or so, why do you think it is going to work this time...??? I think it is getting life tougher in Mekelle holes for the coward TPLF goons and we love it..
May God bless the Honorable Prime Minister of Ethiopia Dr. Abby aka the most effective Foreign Minister of Eritrea. May God bless Eritrea and Ethiopia. Eden, I admit I cannot understand any Ethiopian language other than Amharc . But what has that to do with my argument. I did say Abiy is not expecting every Eritrean to agree with his politics. In fact, he does not believe every Ethiopian to agree with his politics. Cool down Eden, having a demonstration is not a sign of having unpopular government, most broably it id a a sign of having a free society having the right to express its beliefs. They must do this to show Isias, he is trapped now and he must listen to eritrean demand or step down. Poor Sam I know you are fair guy but here you are wrong I really believe. This may or may not help Weyane but that is another issue. Since you lack Tigrigna, I'll break it down for you just in case that's why you missing the depth of the issue. PM Abiy touched a nerve when he said even those who left Ethiopia will come back let alone the existing ones to go away. Good for domestic audience but Eritreans as people, not just as oppositions, are pissed. Eritreans also took issue with the PM saying being against Haile is being against Ethiopia. Why you find this to be unfair expression tells me you are missing the points. How do you expect Eritreans to react when a sitting PM next door is taunting them into forgetting their sovereignty and they will come back sooner or later. He is saying their 30 years sacrifice is for nothing and they will learn this in due time. This could be right or wrong but saying it by PM is dead wrong. How do you expect Eritreans to react when a sitting PM next door is taunting them to oppose the building of statue for the King they consider is at the heart of their 30 years war for independence is to oppose Ethiopia? BTW aren't you Tigres going to protect Eritrea from Ethiopia, why do I need to worry? Eden, after all what Abiy had said Isayes and he remains being friendly. Well, I am surprised why the demonstration will not target Isayes. The Mekele politicians had thought , I think, it might be much easier to rally Eritreans against Abiy. The Amharas are coming back slogan might rally Eritreans is the Mekele conspirators working definition , it seems. It is not working though. By the way what is wrong of his saying there will not be anymore Eritreans to be deported. And those who were deported will be welcome back to Ethiopia if they choose to. I tried to understand why Eritreans would be against such move. Eden, it is another helpless cry of the dying Sebhat dynasty. Eden,, I forgot one point to address. If Ethiopians choose to build statue of Haileselassie, they do not ask permission of Eritreans to do so. Ethiopia is a sovereign country as Eritrea is. Eritreans choose their heros. So do Ethiopians. Eritreans do not choose their heros consulting with Ethiopia. Ethiopians do not choose their heros with the approval of Eritrea. We are talking about two independent countries here, Eden. Sam - I agree with your points but those are not the issues. I spelled out the issues above. Eden, stop playing dumb. Even worse, stop taking ppl here for dumb. Abyi said, "I'll be your unofficial Foreign Minister" too when he was in Eritrea. Does it mean, that he's? PIA's, "You'll lead us" has to do with the peace process & regional integration. It doesn't mean, Abyi is gonna take over the day to day administration of the Eritrean State. The Eritrean State is here to stay, as for you tegaru's place in this region? I have no idea. FreeAgamian, you [deleted] didn't I tell you to stop hallucinating? How is that I, the one who is leading Eritrea is not the spokes person of all Eritreans and as agame you are telling the traitors Eritreans are? If they were, they would be leading the country instead of hiding under their wives and mom's smelly skirts to be spokes persons of Eritrea? You are a filthy agame who is desperate and fighting that your mom don't crock of starvation and acting Eritrean. "The sovereignities and territorial integrities of all the regional countries who are working hand and gloves to beat poverity are honored, respected and will not be alteted"
So, why are you freaking a'ss wipes leaving those and telling yourselves what you didn't hear is correct. I know that you dirty agame will assume Eritrean citizenship if given, but as an Eritrean I would never accept other nationality and I believe the genuine ethiopians won't accept Eritrean citizenship if given the chance. It is all about dignity and pride which you tegarus have none. Put a cork in your tegwar agame a'ss you filthy creature. It is your freaking business to anounce that you eat di*ks and get invaded in your a'ss hole by other men di*ks, but quit assuming every body is like you fa*g*got. Just focus on the topic and respond accordingly. Eden warned me Weyanes are interfering with my thinking. Not that I am aware of. What is happening rather , Eden, I am living in the brains of of the Mekele conspirators. Not literally. Ali of Ethiopian Somali is no longer there to take orders. Daud Ibsa did not mobilize the Oromos against the Abiy adminstration as they hoped.The Benshsngul politicians has started locking up trouble makers. In Ethiopia the Abiy administration is changing the politics of the country. The Sebhat dynasty is running out of option here. Time to call a demonstration in USA. I wonder how many Tigreans would join the demonstration. Will they outnumber the Eritreans who join the demonstration ? Well, we will see.